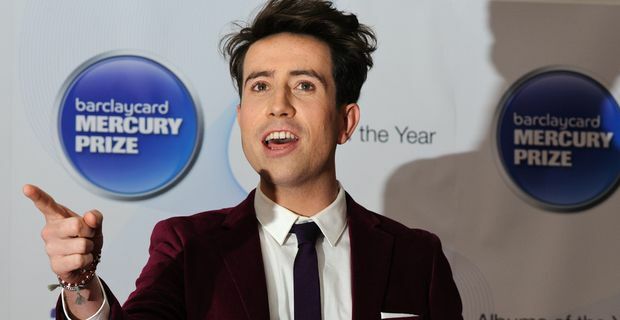 The BBC has decided to give Radio 1 breakfast host Nick Grimshaw a spot of hype. The task of following heavyweight Chris Moyles was always going to be tricky, but Grimshaw has a key advantage: a host of impressive celebrity friends. A new spoof promo video is chock full of famous faces. The amiable Grimshaw is the antithesis of Moyles. Whereas everybody seemed to loathe the tubby motormouth, everybody seems to have time for Grimshaw. And "everybody" in this instance includes such luminaries as One Direction, Nicole Scherzinger and Hollywood stars, Jake Gyllenhaal and Hugh Jackman. In the video Grimshaw performs a lip-synch version of Kanye West’s hit 'Clique'. Donning gangsta gold teeth and a fur coat with gold chains draped off his neck, Grimshaw’s polite BBC pronunciation proclaims that "I've been gangsta for time, I'm ready for this. But is the world ready for me? Probably not." To those with long memories it seems a spot-on parody of Grimshaw’s Radio 1 predecessor Tim Westwood, the vicar’s son who liked to talk ghetto, more than it is of Kanye, but it is all impeccable fun, as a host of TV and music stars including Rita Ora, Tinie Tempah, Pixie Lott, Louis Smith, Kelly Clarkson and Matt Smith and Radio 1 colleagues such as Fearne Cotton, Sara Cox, Scott Mills and Greg James join in. The promo is being given what radio people call "heavy rotation" across BBC TV channels and being pushed heavily on Twitter, where Grimshaw’s followers are being invited to spread the news. He has previous when it comes to spoof videos, having made his own version of Justin Bieber’s 'Beauty and the Beat' last year, but that didn’t quite have the star quality of the 'Clique' clip. It’s a two-minute tribute to Grimshaw’s networking skills. The jury is still out on his breakfast show, but it’s apparent that when it comes to self-promotion Grimshaw leaves Moyles standing.